Last night's trick-or-treat event was a smashing success. We had available to us about a thousand pieces of candy, but still managed to run out before it was quite done. Halloween is the biggest deal of the year on our street, the mysterious and legend-shrouded Carey Place. Only about four blocks long, from NW 17th to NW 21st street, it is a narrow street that is really as much a pedestrian path as a street for cars, and even more so on Halloween when the ends of the street are barricaded to car traffic and the children are allowed to roam free. That link above goes to an article about the street, explaining the legend of its haunting. Other versions of the story include such frightful details as this: Supposedly attempts have been made over the years to replace the "Hatchet House's" shutters to get rid of the ax designs in them. Also, attempts have been made to repaint the house's blood red porch. But the axes always reappear...and the red always returns. Boo! This cool kid in the picture is Ewan. 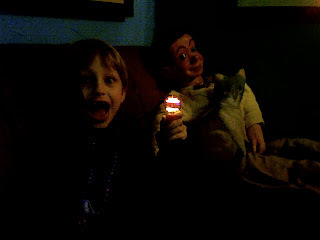 He is the son of our good friends Brian and Hayden, and he is sitting in our library (the M-Brane office itself) with the enigmatic Tommy and his pet Flat Cat.